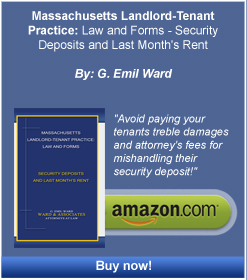 Housing Discrimination - Boston Real Estate Attorney. Eviction Law. Zoning and Variances. Housing Discrimination. Disability and a number of other bases. Unlawful discrimination is an ugly fact of life. Discrimination in housing can create not only a deep, personal emotional hurt, but this pain is frequently exacerbated by the uncertainty of not knowing where one will live. Housing discrimination damages for the victim may now encompass money for emotional distress, out-of-pocket expenses, compensatory damages, punitive damages and attorney’s fees. Both by reason of Mr. Ward’s having authored a book on the subject and by virtue of the firm’s experience in discrimination cases, Ward & Associates is well suited to handle the legal aspects of resolving housing discrimination claims. Because the statute of limitations, in other words, the date by which one must file a complaint or lose the right to do so, varies depending on the legal basis, it is best to seek legal assistance as quickly as possible. The filing deadline for housing discrimination claims under the Massachusetts statute is twelve months after the alleged discrimination occurred. If you or someone you know is being sued for alleged housing discrimination, please contact us to obtain a consultation. We can then discuss the facts of your case, fees, and the degree of potential exposure to potential damages and the process for such claims. Our firm has represented both owners and managers and complainants at MCAD and in the courts.